I know today is Wednesday and this recipe does not belong here. It’s a joke to think that you can come back home at 6:30 and start preparing for Mousaka. So, yes, it’s a weekend recipe. We enjoyed it with our guests on Sunday. There’s plenty of versions for this dish and as many ways of cooking it. 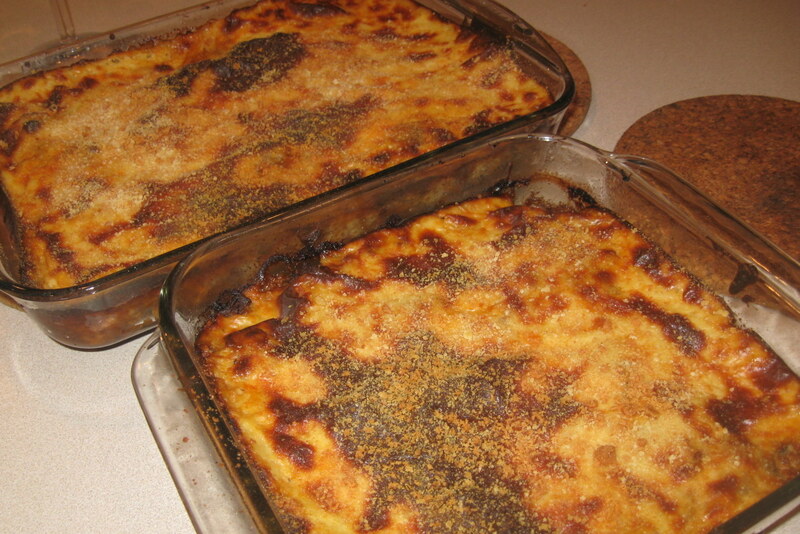 The heart of the dish is eggplants, meat sauce and bechamel on top. The variations are with added layers of zucchini and/or potatoes. I used zucchini but no potatoes. The traditional recipe calls for deep fried vegetables that you let drain overnight to lose their oil. Deep fried veggies are no go for me. So, I looked for alternatives and decided to do Vicky’s version from tastefull.gr with vegetables grilled on stove top. Perfect! How to make the meat sauce: Heat a tablespoon of oil in a sauce pan. Add the minced meat. Saute for a few minutes. Add the onions and saute for another 5 minutes or so or until the meat has browned and there’s not much liquid left. Add 2 cloves of garlic minced or two frozen cubes of pulped garlic. Let it saute with the meat for a minute. Add 1/4 cup red wine or soy sauce. Let it cook for one minute. Add the tomato sauce, vinegar, pinch of sugar, salt, pepper, dry mint, pinch of cinnamon. Let the meat sauce cook at low heat for about half an hour to 45 minutes until there’s not much liquid left. How to make prepare the vegetables: I used a stove top grill pan. Very convenient. First peel the eggplants and slice them. Put some salt on them and let them stand for a while. In the meantime, wash and slice the zucchini. Put some olive oil in a small bowl. Brush the eggplants with a little olive oil. Don’t skip this step. The eggplants need to be oiled before going on the grill. Grill them on one side and then flip over to grill the other side. Continue with the zucchini. You don’t need to oil the zucchini but I did a very quick and superficial brushing, dipping the brush only a couple of times in the oil. Done with the veggies. How to make the béchamel: Heat the oil. Add the flour and saute for a minute or two. Add the hot milk and stir with a whisk until the bechamel is smooth and creamy. Add salt, pepper, nutmeg. Stir in the cheese. Let it steam off for a few minutes stirring and fold in the two eggs slightly beaten. How to put it together: Cover the bottom of the pan with a thin layer of bread crumbs. Arrange a layer of eggplant slices. Add a layer of zucchini slices. Add a layer of minced meat. Top with the bechamel. Sprinkle some bread crumbs and grated cheese on top and cook at a medium oven for about an hour. Enjoy! It’s not difficult to make. Just busy work.